The Tenant Of Wildfell Hall by Anne Brontë was an entire mistake. It should never have been written, and it would be better for everyone if it never saw the light of day again. These aren’t my views of course, in my eyes Anne Brontë’s second and final novel is a soaring work of genius. Nor are they the harsh words of a critic, although many contemporary critics were in agreement that this was a rough, brutal, ungodly book. No, these words are the judgement of Anne’s elder sister Charlotte Brontë, and they would have a huge impact upon Anne’s reputation. This verdict was unfortunately to be a lasting one. In effect Charlotte prevented the re-publication of The Tenant Of Wildfell Hall at a time when it was still in the public eye, and when it had in fact been a huge success – the first edition selling even quicker than Jane Eyre had. The novel was buried along with its writer, and would in fact not be published again until another ten years had passed. 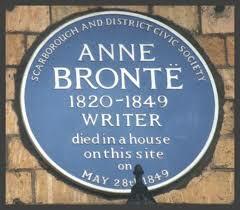 This removal of Anne’s great novel from the Brontë canon caused great damage to her place in literary history. 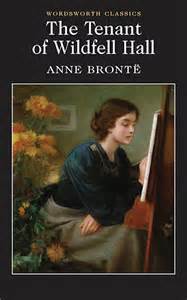 By the time the book reappeared it had been almost completely forgotten, and people thought of Anne as merely a footnote in the story of the brilliant Charlotte and Emily Brontë. Unfortunately, this attitude endured for a century and more, and only now is the book and its author getting the recognition they deserve. This is a clue to one reason why Charlotte hated the book so much – she blamed it for Anne’s death. The intensity of the book, and Anne’s refusal to stray away from the truth brought a mental and physical strain that was greater than her frail, youngest sister could bear. There is another clue in Charlotte’s paragraph above: Anne had for too long had to witness talents misused and faculties abused, and rather than ignoring this dread spectacle she had put it on paper as a warning to others. Read between the lines, and it’s clear to see that Charlotte believed the book was about their own brother Branwell. During his final and fatal decline into drink and opium addiction, Charlotte had turned her back on the brother who had once meant more to her than anything in the world – with one contemporary chronicler saying that she didn’t speak to him for two years. Anne, however, took a different course, and in Charlotte’s eyes a very wrong course. 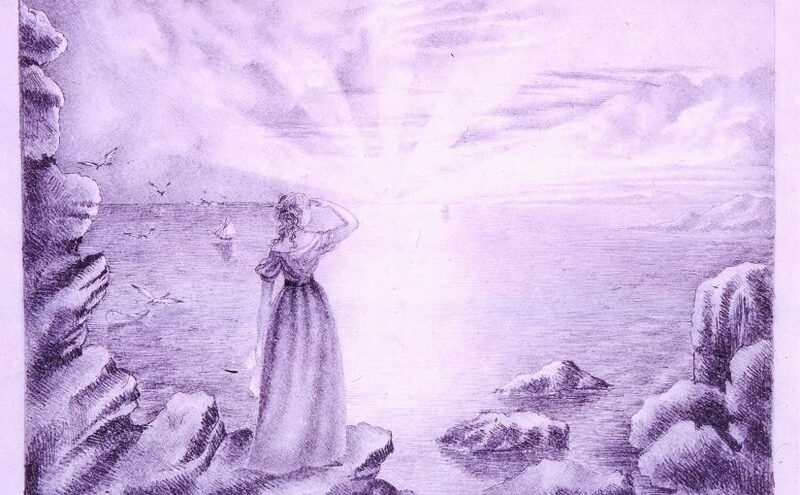 Anne Brontë believed above all things in the power of redemption. However great a sinner you were, however many your faults and mistakes, you would eventually be redeemed and find peace in Heaven. This is at the hear of Anne’s poem The Penitent and especially at the heart of The Tenant Of Wildfell Hall. 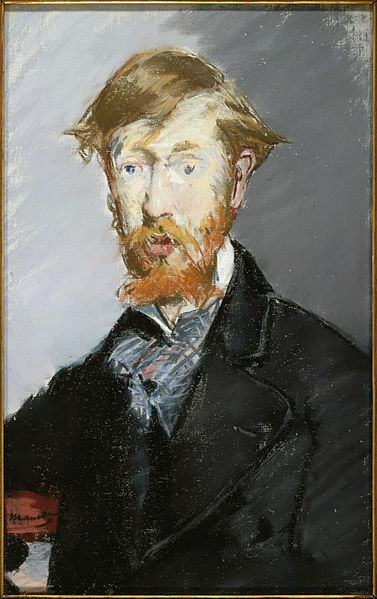 We see Arthur treating his wife Helen appallingly, drinking to excess, having wild drink and drug fuelled parties, disappearing for months at a time, verbally beating her into submission, stealing her possessions, destroying her work. And yet, after Helen’s escape to Wildfell Hall she returns to him to nurse him in his final illness. Why? Because it is the right thing to do, whatever the cost to herself, and because she believes that she can still save his soul. Charlotte was undoubtedly shocked at some of Branwell’s failings being exposed to the world in the shape of Huntingdon, although he is also present in the character of Lowborough, who deep down has a good heart and tries, and fails, to beat his addictions. 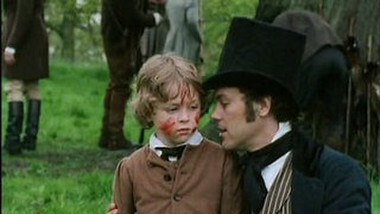 Even more terrible to Charlotte was that it brought home to her her failings in Branwell’s last months and weeks. She had not stood by Branwell in the way that Anne and Emily had, and now it was too late. The book was too painful for her to read, and the thought of others reading it and passing judgement, unwittingly, on both Branwell and her was also too painful to contemplate. It was for this reason above all others that Charlotte had The Tenant Of Wildfell Hall suppressed. Charlotte’s judgement on the book and upon Anne Brontë was all wrong. Writing the book did not do Anne Brontë harm, she was not the frail thing her sister always pictured. She was a strong woman with a burning desire to tell the truth by holding a mirror up to society’s failings. That is why The Tenant Of Wildfell Hall is more relevant today than it has ever been, and as loved today as it has ever been. It is a book that has overcome misunderstanding, contempt, suppression. Its time is now. As you may know, in the last few weeks this Anne Brontë website changed to a new hosting company, meaning that I’m having to upload the hundred plus previous posts one at a time – don’t worry, it will be fully stocked again soon! For this reason, some of the events mentioned in the posts may be out of date – as in this post. I’m afraid you’ve missed Gregg Wallace and John Torode rushing around Haworth, but as Masterchef has now returned to our screens I thought it a fine time to put this post in the public domain again. I hope you enjoy it! If you didn’t already know, Celebrity Masterchef has reached the semi-final stage, and tonight it’s coming from Brontë country! The show sees eight celebrities battle towards a place in the final. 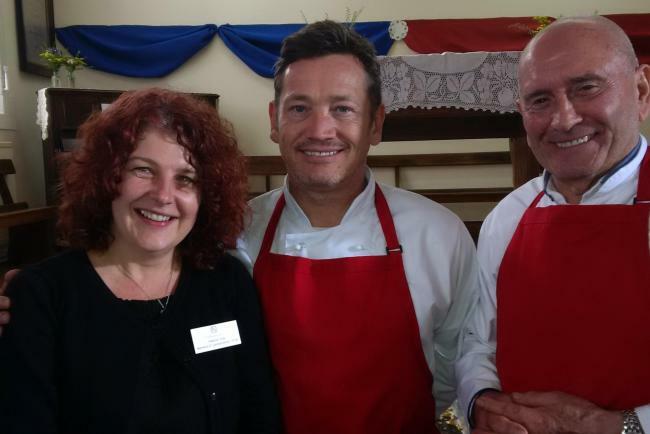 Stars as diverse as Sid Owen, Louise Minchin, Tommy Cannon and Reverend Richard Coles will be battling it out, and tonight they’re going to be cooking up a storm in Haworth. It’s very appropriate that they should be in Haworth this year, of course, as it’s the 200th anniversary of Charlotte Brontë‘s birth and the beginning of a four year ‘Brontë 200’ period that will also witness the bicentenaries of Emily and Anne Brontë. It’s already one of my favourite television shows, and from what I’ve seen tonight’s show should be particularly exciting for Brontë fans. The celebrities will be walking up Haworth’s steep, cobbled Main Street before heading out onto the moors to cook up a feast for guests dressed in 1840s attire. I’m sure the results will be Celebrity Masterchef’s usual mix of the incredible and the inedible, but what do we know about the cooking and dining habits of the Brontës themselves? 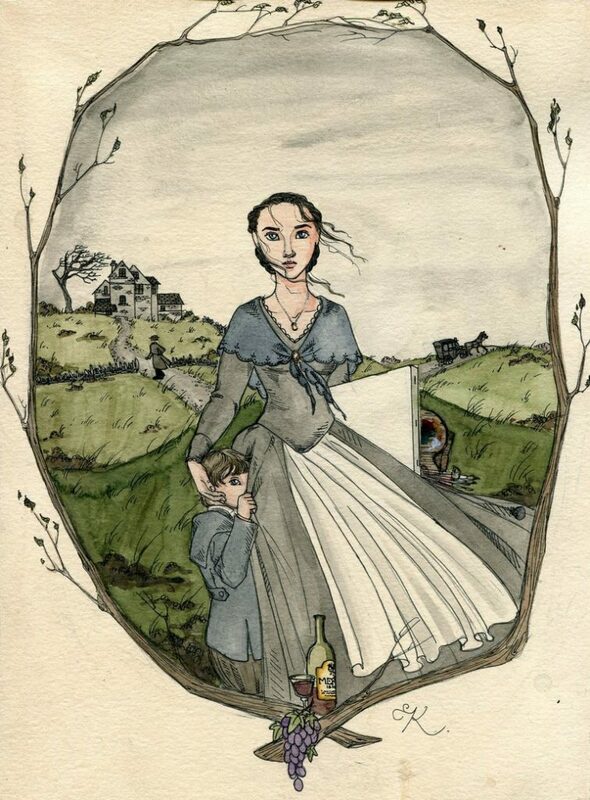 Mrs. Gaskell, in her biography of Charlotte, said that they ate little meat, but this erroneous tale came from a servant who had been dismissed by Patrick Brontë and so had a grudge to bear against him. Potatoes were a staple of the diet in the Parsonage, and as this was sheep farming country mutton was a regular addition. We can guess that Charlotte was talking about Tabby here, rather than making such a judgement about herself. We’ll see at 8pm on BBC One whether the celebrities have as much of a dainty hand. I just hope that we don’t see a windswept Cathy coming over the moors and shouting ‘Rickaay’ instead of Heathcliff! Talking of television, I myself am appearing on BBC Two at 8.30 on Monday as a contestant on the quiz show Only Connect. Alas, there were no Brontë questions! Posted on 2nd April 2017 Leave a comment on The Baking Skills Of The Brontë Sisters! Anne Brontë’s masterpiece ‘The Tenant Of Wildfell Hall’ is perfectly suited to the little or big screen, with its dramatic scenes, characters you can’t help but care for, romantic intrigue, and a classic villain on the fast road to self-destruction. And as I found out when I watched a 1996 version over the last week, the BBC have really done it proud. The first thing to say is that it is an immaculate production: the cinematography and lighting are superb, and the theme music is really haunting as well. Thankfully, unlike some modern shows we can all think, there is also a complete absence of the mumbling that has blighted many recent dramas. It’s a very fresh looking production, and it’s hard to think that it is actually now twenty years old. The casting is perfect too. In the title role of Helen is Tara Fitzgerald, probably known to many viewers now for her recent runs in Game Of Thrones and Silent Witness, but an actress I’ve loved ever since her early film appearances in Hear My Song and the great Brassed Off. She has the perfect combination of frailty and hardness, naivety and experience, and it’s easy to see why both Huntingdon and Markham fall in love with her. 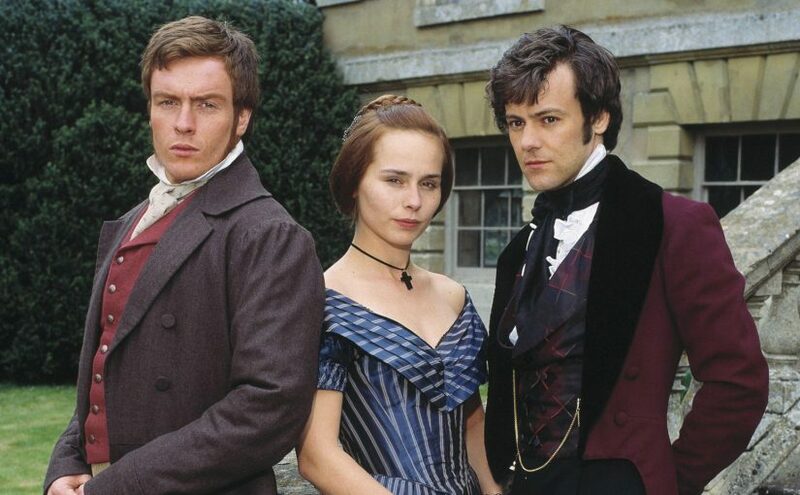 Toby Stephens plays Gilbert Markham, which can make Brontë fans do a double take as he was later to be a superb Rochester in an excellent BBC adaptation of Jane Eyre. I was particularly impressed by his Yorkshire accent, although it was noticeable that this television adaptation played down the bumbling fool aspect of his character that was emphasised by Anne. The villain of the piece is of course Arthur Huntingdon, played by Rupert Graves. Once again, I think he is an excellent choice. He oozes menace and selfishness throughout, and this adaptation doesn’t shy away from showing his violent, abusive nature. All in all, this is pleasingly faithful to Anne Brontë’s wonderful storyline, with one major difference. Towards the end of the novel, Markham comes to the misunderstanding that Helen is marrying someone else, and he rushes to see her but finding her at a wedding feels that he has arrived too late. In this adaptation, however, the roles are reversed. Helen returns to Wildfell and sees Markham at a wedding, becoming distraught at the thought that she has missed out on a chance of true love. The ending is the same, however, as the misunderstanding is revealed. I will certainly have this BBC adaptation as an annual viewing treat from now on, it was a thoroughly enjoyable serial that I think Anne Brontë would have approved of and been proud of. It even transposes a scene from Agnes Grey into the story, with young Arthur maltreating a bird. I bought it at the Brontë Parsonage Museum in Haworth, but you can also pick up a copy on Amazon. 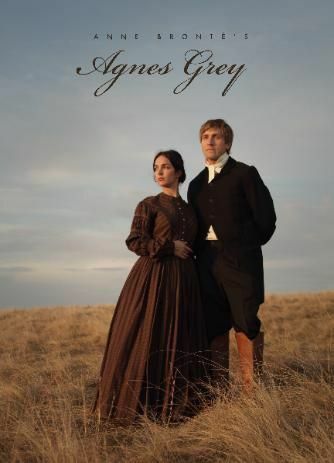 I do wish the BBC would also make an Agnes Grey adaptation, but I am looking forward to seeing their new Brontë drama coming later this year. 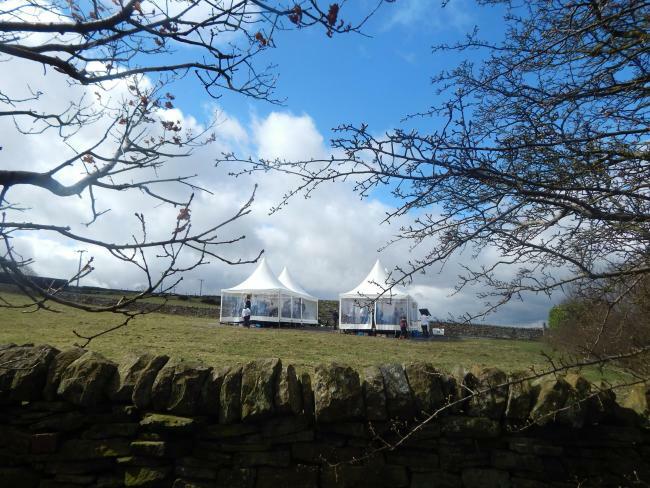 They’re building a complete replica of the Brontë Parsonage and the parish church on the moors beyond Haworth. Here’s a picture of how it’s coming along, and I await its progress with interest.